Airborne launching of rockets into space has taken a giant leap forward with Stratolaunch having its first high-speed taxi test. 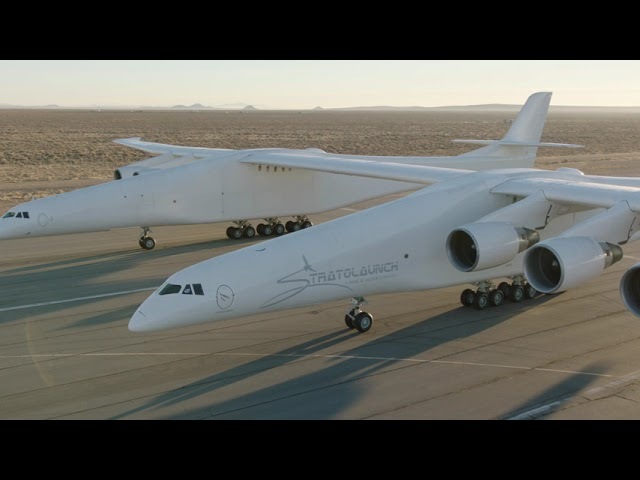 Stratolaunch, the aerospace venture created by Microsoft co-founder Paul Allen, says its twin-fuselage, six-engine aircraft raced as fast as 118 knots (219 kilometres per hour) down the runway at California’s Mojave Air and Space Port last week during its latest taxi test. That’s almost take-off speed for the Stratolaunch, which is the world’s largest plane. The taxi test also included a brief ‘rotation authority manoeuvre’ where the plane’s nose gear lifted off the runway and is the latest of a series of taxi tests where the plane travels down the runway under its own power but does not get airborne. As covered in Flight Safety Australia in June 2016, the purpose of the Stratolaunch is to provide a low-cost way of launching commercial satellites. It uses engines, fuel systems, hydraulics, avionics, landing gear and cockpits from two recycled Boeing 747s and has a wingspan of 117 metres (385 feet) which is 47 metres more than an Airbus A380. It will carry rockets weighing more than 200 tonnes under its centre wing section and when it reaches an altitude around 35,000 feet (10,668 metres), the rockets will be launched. This recent test suggests that after more than seven years of development and three months after Allen’s death, the plane is getting close to its first flight. When Stratolaunch is ready to be airborne, it will take 18 to 24 months of test flights before it can receive certification from the Federal Aviation Administration (FAA). Once this stage is complete, the plane can begin its role as a launch platform—probably sometime next year or the year after. Eventually, the plane could accommodate up to three rockets for separate launches during a single mission.